SIMFEROPOL, February 11. /TASS/. 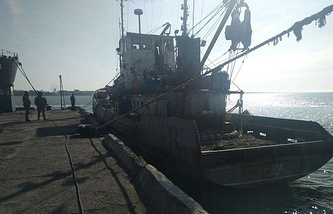 The captain of Russia’s Nord fishing vessel arrested in Ukraine, Vladimir Gorbenko, did right when he left Ukraine as he could not have had a fair trial there, Crimean Human Rights Ombudsperson Lyudmila Lubina told TASS on Monday. According to earlier reports, the vessel’s captain Vladimir Gorbenko returned to Crimea from Ukraine. "He did the right thing. As far as I know, they were reluctant to let him leave the country with his Russian passport. There were travel restrictions so how could he leave? Was he expected to hope for a fair trial? Justice is long gone in Ukraine," Lubina said. Meanwhile, Russian Presidential Spokesman Dmitry Peskov declined to comment on Gorbenko’s return, only saying that "the result speaks for itself." "I will not comment on that. The main thing is that he is now back home in Crimea. This is what is important, while we will learn details in the future, or maybe we won’t. However, the result speaks for itself," Peskov said. When asked how Moscow would react if Ukraine requested Gorbenko’s extradition, the Kremlin spokesman said that "such things are done through diplomatic channels so this is a question for the Foreign Ministry."